Connect with Facebook and you can add your own League Menu here! 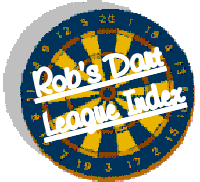 Rob created this dart league index in the hope that every dart league from county level right down to local leagues will register their details and allow people who are looking to play darts to find out all they need to know about leagues in their area. If you run or know of someone who runs a league in your area and it is not listed here then do please let me know by clicking connect in the top right to connect with FaceBook (if you haven't already) and then click Contact Rob at the bottom of the menu on the left.